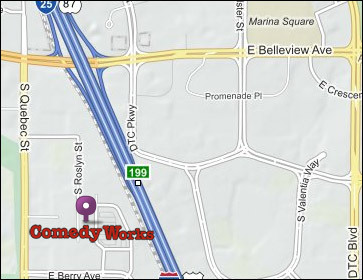 In the fall of 2008 Comedy Works opened a second location at The Landmark in Greenwood Village. Located just off I-25 between Belleview and Orchard, this state-of-the-art venue carries on Comedy Works’ legendary reputation for providing world-class comedy, and so much more. Lucy Restaurant is open for breakfast and lunch 7 days a week with breakfast being served all day and lunch beginning at 11am. You can also enjoy preferred seating in the showroom when you dine with us before the show. Lucy restaurant, located above the club on the 2nd floor of our building. 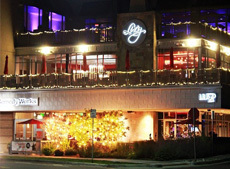 Lila B Lounge, is an intimate gathering spot, just steps from the DTC where you can socialize, drink and snack inside or out on our gorgeous patio. We offer a fantastic weekday happy hour and live music nightly. In addition, the Curtis Ballroom, located on the 3rd floor, has created a buzz for being the venue of choice for hosting business functions, wedding parties, reunions, proms and private events. And best of all, plenty of free parking surrounds the club. For more information, call us at 720-274-6800.